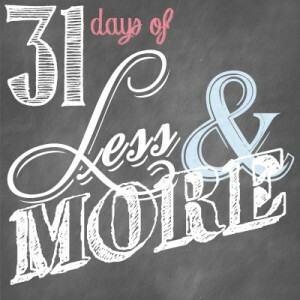 This is Day 6 of our 31 Days of Less & More challenge. To read all the posts in order, start with Day 1, then visit the Overview Page to see the entire series. 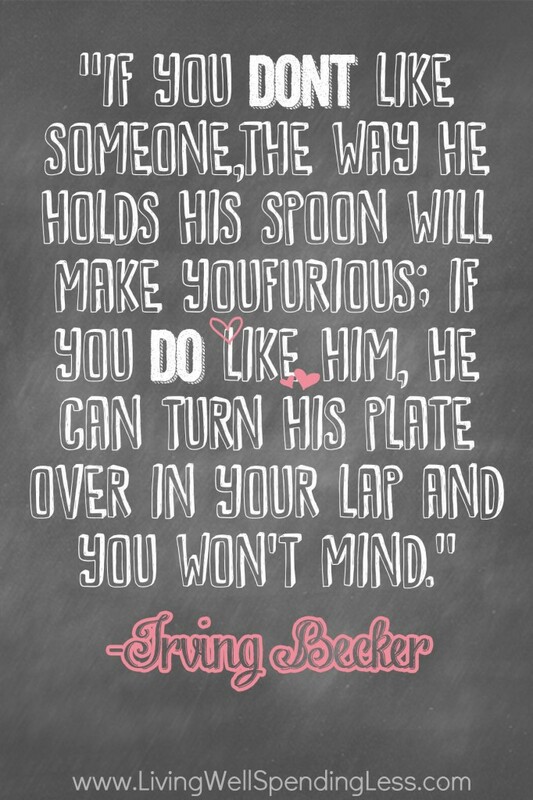 Have you ever noticed that if you’ve been arguing your spouse can suddenly become intolerably irritating? Even the smallest, most inconsequential movement—the way he holds his spoon—becomes so grating that you begin to question what you ever saw in him in the first place. You begin to nitpick the tiniest infractions, and before long your small argument has escalated into all-out war. I’ve noticed that this same phenomenon happens all the time with friendships and family members, with school committees or church groups or pretty much anytime there is more than one person in the same room. What started out so well devolves into a mess of infighting, heated arguments, back-stabbing and hurt feelings. The fact is that we humans don’t always get along that well. But discord in our homes, churches, and communities can at best cause a lot of undue stress, and at worst destroy the most important things in our lives. While it would be nice to point the finger elsewhere and place blame wherever we can, the hard truth we sometimes need to face is our own culpability when it comes to relationship fallouts. Are our perceptions so tainted by hurt feelings or anger that we are finding fault with the smallest things? Is it possible we are we making the problem worse by harboring resentment, stirring the pot, or by not holding our tongues when we should? It is not always easy to make the first move towards resolution. Deep down no one wants to have to swallow their pride or admit that they might be at least a little bit wrong. Even so, just like we talked about on Day 3, harboring bitterness & anger will ultimately only hurt ourselves. If you are facing discord somewhere in your life, whether it be in your home or in some other important relationship or group that you are a part of, be the one to take the first step towards reconciliation and harmony. Be willing to look inward and accept your share of the blame, then resolve to amend your own behaviors, reactions, and attitudes, before assuming the worst of those around you. Be sure to read Edie’s corresponding post, More Harmony. Identify a situation in your life where there is conflict, resentment, or discord. It could be in a friendship, family situation, or group you are a part of. Take an honest look at your own contribution and culpability to this particular situation, then think of one or two things you could do today to help resolve the conflict, ease the tension, or move towards reconciliation. Can you think of an area of conflict or discord in your life? What is something you can do to help resolve it? Yikes….this one hit very close to home. Wow! I can think of a few things. And it’s entirely my own war. The others have not a single clue. It’s just silly…lol! But before it gets any further I’m going to make peace with it & be nice. Thanks!